The fifth book in the Human Legion series is available from Amazon now in its Kindle edition. Paperback to follow shortly. 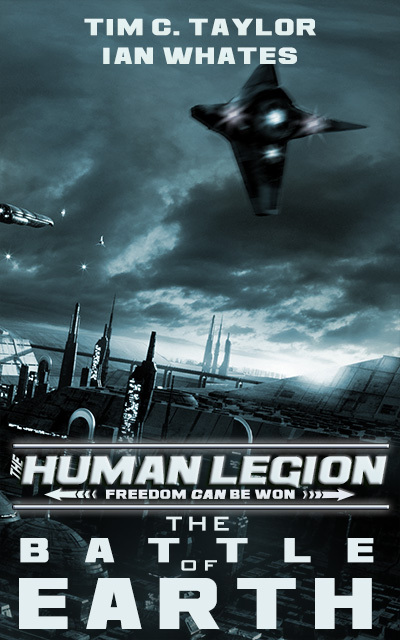 As is Legion custom, I’ve set a low launch price for loyal humanlegion.com subscribers to pick up the book for a song. I’ll be raising the price shortly, probably next week. I do get asked whether it’s more helpful to me to wait and buy at a higher price, a question that I’m grateful that people want to ask. Actually, buying now does help me because at this stage it’s all about getting the book in the charts and the Amazon selling algorithms so that people notice the book. There will be one more novel in the series, The Battle of Earth. No prizes for guessing where that’s set. I do plan for a collection of short stories to fill in the gaps in the timeline, explore the lives of characters who don’t get center stage in the main series, and generally have a good time. But that’s some way off. There’s also the Sleeping Legion, Revenge Squad, and Human Dynasty series coming at various stages. We’re not done yet! Just got it starting in a short while, must walk dogs first. Just got the book, now I know how a rare Friday-off from work will be spent! Awesome , thanks , already purchased. Curiously only for .99$ , is that normal ? Just a launch price. A burst of initial sales helps to get the book in the bestseller charts… Well, it’s worked for me before. Hopefully this time too. ok, makes sense , but I would have also paid 5 🙂 … this far into the series. Seriously though, when I think back to book one of the series and how the whole Human Legion universe has grown, I think you’ve created an amazing journey for your readers. I know it’s been a lot of hard work, but you have a series to be proud of. Thanks. Just asked them to do this. Amazon usually require a prod. Same with adding it to the series list.